(CNN) -- Britain on Friday rejected claims made by the son of Libyan leader Moammar Gadhafi that the release of the Lockerbie bomber was linked to trade deals between Libya and Britain. 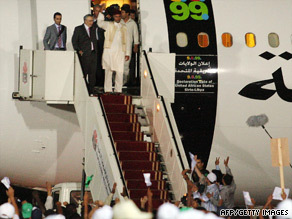 Abdelbaset Ali Mohmed al Megrahi (second from left) arrives in Tripoli, Libya. Saif al-Islam Gadhafi made the comments in an interview with Libyan channel Al Mutawassit, Agence France-Presse (AFP) reported. The interview was conducted while the younger Gadhafi was flying from Scotland to Libya on Thursday with Abdelbaset al Megrahi on board, according to AFP. Al Megrahi had been serving a life sentence for the 1988 bombing of Pan Am Flight 103 over Lockerbie, Scotland, in which 270 people, including 189 Americans, were killed. Scottish Justice Secretary Kenny MacAskill freed him after doctors concluded he has terminal prostate cancer and estimated he has three months to live. "All British interests were linked to the release of Abdelbaset al Megrahi," AFP reported Gadhafi as saying, citing the Al Mutawassit broadcast. "In all commercial contracts, for oil and gas with Britain, (al Megrahi) was always on the negotiating table," Gadhafi said, according to AFP, adding that then-Prime Minister Tony Blair raised al Megrahi's case each time he visited Libya. The British Foreign Office in London promptly denied the claims, saying in a statement issued late Thursday that "there is no deal." "No deal has been made between the U.K. Government and Libya in relation to Megrahi and any commercial interests in Libya," said the statement, obtained by CNN. "All decisions relating to Megrahi's case have been exclusively for Scottish ministers, the Crown Office in Scotland and the Scottish judicial authorities." Saif al-Islam Gadhafi also called al Megrahi's release "a victory that we offer to all Libyans," according to AFP. The State Department blasted Gadhafi's comments. Assistant Secretary of State P.J. Crowley told CNN that "al Megrahi is a terrorist and mass murderer, and any triumphalism is disgusting." "We have told the Libyans that he should not be considered a hero -- not today, not ever. The Libyans are aware that their treatment of Megrahi will have a profound impact on our bilateral relationship," Crowley said. U.S. President Barack Obama on Friday said the joyous welcome al Megrahi received after arriving in Libya was "highly objectionable." British officials also offered criticism. In a written statement Friday, Saif al-Islam Gadhafi thanked "our friends in the British government who played an important role in reaching this day, and I can assure them that the Libyan people will never forget the courageous stand of the British and Scottish governments. I can also assure them that the friendship between our people will continue to be strengthened and that this past chapter is now firmly behind us." Al Megrahi always maintained his innocence, complaining that he had spent years in prison for something he did not do. "The remaining days of my life will have to be spent under the shadow of the wrongness of my conviction," he said in a statement issued Thursday through his attorney. He also offered sympathy to the families of the victims. The Libyan government had accepted responsibility for the bombing and compensated victims' families in a $2.7 billion deal that paved the way for sanctions against Libya to be dropped and for Tripoli to improve ties with the West. But on Thursday, after al Megrahi's return, the Libyan official news agency JANA issued a statement from the government saying that al Megrahi had been "a political hostage," as evidenced by his release.